love how many Gmail tricks there are — especially the one that automatically deletes messages from specific senders before they reach your inbox. For the last month or so my inbox has been overflowing with junk mail and spam. And while I didn’t want to close my account, I was getting sick of weeding out 30+ unsolicited emails a day from the ones that mattered. My friend told me about an easy filtering trick that she was using to avoid emails from her ex-boyfriend, which totally works for spammy messages as well. Find out what it is when you read more. 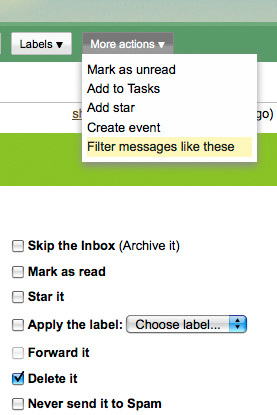 If you need certain emails to disappear like we did, it’s really easy to do: when you have the email opened, choose the “Filter messages like these” option under the “More actions” toolbar. From there, choose what you’d like Gmail to do with it — whether that means archiving, deleting, or forwarding the message, it’s up to you. Since I wanted to put an end to getting all this junk mail (there was no option to unsubscribe to these messages, BTW), I chose “delete.” Since then, my Gmail inbox has been looking quite tidy! And now my friend can get through her workday without the fear that an email is going to show up in her inbox from her stalker ex. Sometimes, out of sight really equals out of mind! Outlook allows you to filter messages based on a list of e-mail addresses of junk and adult content senders. If you do not wish to receive these kind of messages, Outlook can search for commonly used phrases in such messages and automatically move them from your Inbox to a junk e-mail folder, your Deleted Items folder, or any other folder you specify. Click Inbox. Then, on the Tools menu, click Rules Wizard. Click check messages when they arrive, and then click Next. Select the check box next to with specific word in the subject. In the text area below, click the blue, underlined phrase specific words. Here you can specify which words Outlook should look out for. For example, in the Add New text box, enter JOKE and then click Add. Repeat for any additional terms you want to check for. When you’re done, click OK and then click Next. To apply the rule to e-mail already in your Inbox, click Run Now. In the Select rules to run list, select the check box next to the rule you just created, and click Run Now. This will delete all e-mail in your inbox with the subject “JOKE.” When the process is complete, click OK.
Now, anytime you get e-mail with the subject “JOKE,” Outlook will automatically move it to your Deleted Items folder. The e-mail will still be available in your Deleted Items until you empty the folder.